Today was a red letter day for me. First, I found out that my Moon Beams cards was picked for the Top 5 at Tuesday Morning Sketches , a big Thank You to Melissa and her team.Then, I went to the mailbox and found that Nancie Waterman at Vamp Stamp News chose my B-G-S Birthday Joy Fold card to be in the May 2010 issue.If you are not familiar with Vamp Stamp hop over and check it out. Nancy always has informative articles, and tips with some neat advertisers for shows and products. One reason I'm so honored to be featured in Vamp Stamp News is that I admire Nancy so much, she does all the work of putting out this publication herself, and in my opinion she does a fabulous job. Now, if everyone on the planet can't hear me clapping they must have cotton in their ears. This is so exciting, I've now been published in 3 different magazines and I'm in the process of getting cards ready to go out again for consideration. "Just Us Girls" Challenge JUGS30-Template Challenge--I went through my case of Coluzzle template and came up with this little box. I already have one of the guys picked out to birthday gift it to. Supplies: Coluzzle box template, Papers: Graphic 45-A Proper Gentleman Collection, blue-CTMH, Stampin Up-Whisper White, Stamp: Artful Inkables-Steampunk Sarah, Sentiment-computer generated, Stampin Up-1 1/2" and 1 1/4" circle punches, Ranger Archival Ink-Jet Black, Sharpie poster paint pen-gold, Sakura gelly roll pen-gold, metal rim tag-unknown, gold cord, ribbon-Offray. Congrats on your red letter accomplishments!!!! How exciting! LOVE this box and LOVE the saying! adorable, congrats on the win! 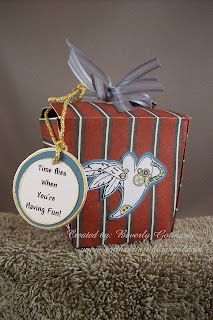 What a cute box - love your tag and the colors you used. Thanks so much for playing along with Just Us Girls this week. Congrats on all of your great news this week! Great little box for the men in our lives and a great example of one of my all time fave tools....good ol coluzze! Thanks so much for playing with Just Us Girls this week! 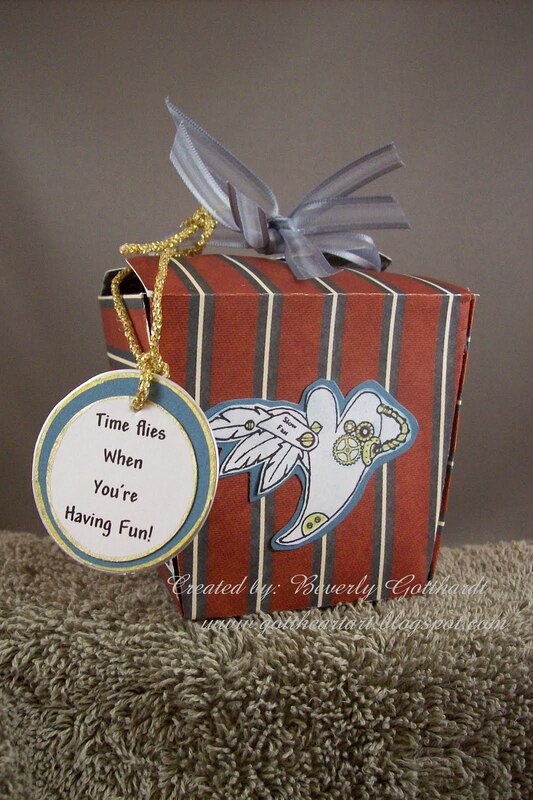 Such a cute little gift box. Congratulations on all that wonderful news!